St. Hugh maintains a strong Catholic identity. Scripture messages and Catholic values infuse all aspects of the curriculum, daily activities, the athletic program, and relationships with the community at large. Symbols of the school’s commitment to the Catholic faith are replete throughout the school from bulletin boards, to crucifixes and statuary, to messages which express the mission of the school. Prayer is an integral part of the daily school life. Morning prayers offered by students and principal over the public address system consist of gospel readings, intentions for the sick and needy, and responsorial readings as well as traditional prayers, such as the Lord’s Prayer or Hail Mary. Confessions are offered before major feasts to all students. The Angelus is recited at noon by students, usually 8th graders, and the entire student body. Prayers precede each class as well. The principal posts the monthly video on the school web site regarding the Catholic Virtue for the month. In addition, the principal writes the Catholic Virtue message in the weekly newsletter. Catholic values are integrated in all areas of the curriculum on a daily basis. Weekly masses are offered in either the chapel for individual classes or in church for the school population and any parents who wish to celebrate with their children and members of St. Hugh parish. Holy days are celebrated by the pastor, associate pastor, or visiting priests for the school population, parents, and parishioners. In an effort to demonstrate its commitment to Christian charity toward the community, special masses are offered at Thanksgiving, with food donations provided by the families of St. Hugh, and Christmas, with toys collected for the poor. The food, clothing, toiletries, book bags, and toy donations are provided for the Grove Outreach (founded by St. Hugh parish), The Barnyard, Mindo Project in Central America, St. Anne’s Mission, and the Sisters of Charity (Mother Theresa’s sisters, who maintain a homeless shelter in Miami, assisting the poorest of the poor). Students are encouraged to perform community service at the Sisters of Charity, the Grove Outreach, and local programs. The 8th grade students also serve meals to the homeless at the Sisters of Charity’s shelter twice a year in an effort to raise their awareness of the poverty in their own community. Students come away with a new appreciation of their own circumstances and the desire to do something proactive to assist those in need and to effect changes for those who are not empowered to do so in their own behalf. The Preschool and Kindergarten program at St. Hugh incorporates an academic curriculum within a play-oriented environment. This integrated approach to learning includes thematic units in all core subject areas such as: religion, language arts, math, science, and social studies. The classrooms are organized in centers that provide each student with an opportunity to learn in a hands-on environment. Beginning in the Pre-K3 classroom, the teacher creates an environment that provides the students with opportunities to learn with interactive play time. The teacher organizes the centers, enhancing the student’s cognitive, social, and spiritual growth and development. St. Hugh provides the Pre-K3 student with activities that stimulate all areas of development such as; number recognition and counting skills, problem solving skills, phonological awareness, manipulatives to increase fine motor skills, outdoor play to increase gross motor skills, and the use of technology on a daily basis (iPads, SMART Board, and desktop computers). The student also participates in activities such as; show and tell to increase oral development and vocabulary growth, field trips, Buddies Program with the 3rd grade class, Christmas Show, and End of the Year Show. The Pre-K4 classroom teacher continues with the same basic environment of learning centers and the use of technology. The classroom is filled with activities that enhance the spiritual and social growth and development. The academic program introduces formal phonological awareness instruction, alphabet recognition, pre-reading and reading skills, print awareness, oral language, number recognition, counting, problem solving, and handwriting skills. The children are encouraged to participate in daily classroom instructional activities. This class also teaches the students appropriate Scripture stories that tell them of God’s love and connects these stories to the students’ own lives. The student in this class also participates in similar activities such as; show and tell, PK-Café, Christmas Show, field trips, End of the Year Show, and more. The Kindergarten curriculum is required by law to provide instruction in specific academic skills. Through direct teacher lessons, hands-on learning activities and the use of modern technology, the students learn the academic skills required by the Archdiocese of Miami and the State of Florida. These educational opportunities are provided within learning centers that enhance cognitive and creative growth and development. Students are engaged in daily, developmentally appropriate activities that involve instruction in religion, language arts, math, art, social studies, science, music, physical education, foreign language, and computer education. Most importantly, as a Christ-centered classroom, the students are encouraged to follow Jesus’ example by having Him in their hearts in all they do. This class is filled with many exciting and stimulating learning experiences such as; live chick births and the complete butterfly life cycle taught in the classroom. The student will also participate in activities such as; Mass celebrations, field trips, Butterfly, Thanksgiving, and Valentine’s Day Prayer Services, Christmas Show, Easter Egg Hunt with 8th graders, End of the Year Show, and more. 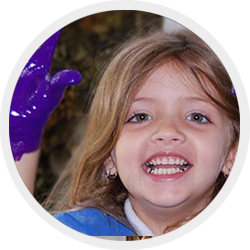 The Preschool and Kindergarten educational programs enhance the development of the whole child. Through the use of age-appropriate technology, interactive play, teacher-directed lessons, liturgical celebrations, and student discovery, the children are provided with opportunities that promote cognitive, social, spiritual, and creative growth and development in a productive learning and loving environment. The core subjects taught in first through fifth grades are: religion, language arts, mathematics, science, and social studies. The religion curriculum is rooted in Scripture that is faithful to the tradition of the Catholic Church. 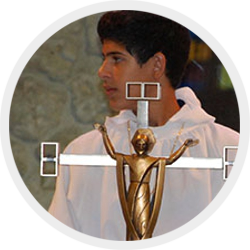 It is a curriculum spirited by the general directory Catechesis centered on the person of Jesus Christ as the students enter into a relationship with God the Father, Son, and the Holy Spirit. The goal of St. Hugh School is to teach students about the Catholic faith and help students grow as followers of Christ. The language arts curriculum focuses on reading skills, reading strategies, and literature. The students work on the development of fluency, comprehension, vocabulary, spelling, study skills, handwriting, composition, and grammar. The students are provided with many opportunities for literacy growth and development in all grade levels. The mathematics curriculum’s primary goal is learning basic math skills and concepts. The student is provided instruction in basic math skills and concepts relating to the four operations as well as word problems, problem solving, Algebraic Thinking, measurement skills (standard and Metric), fractions, decimals, data and probability, graphing, time, geometry, and the use of technology through Smart Board interaction and iPad instruction. The social studies curriculum aims to provide students with a thorough understanding of the people, history, community, government, and geography of the state, nation, and world. The student engages in the integration of knowledge from informational texts and the evaluation of content. Students participate in school wide history and geography fairs. The science curriculum serves to foster knowledge and understanding of life, earth, and physical science. In addition, it serves to familiarize the student’s with the implementation of science inquiry process. The student engages in scientific practices, uses scientific concepts in real world situations, integrates knowledge from informational text, and investigates concepts. The students participate in a science fair. The students attend special subject areas which include art, Spanish, physical education, music, and computer. The core subjects taught in grades fifth through eighth are: religion, language arts, literature, math, science, and social studies. The religion program has a strong spiritual foundation and is embedded in the liturgical calendar. The program focuses on the Church and responses to common religious questions by presenting Jesus as the Way, the Truth, and the Life. It includes all basic topics of ecclesiology, history of the church, and a special program for the preparation of the sacrament of Confirmation. Students also participate in retreats and service activities. The aim of the Middle School Language Arts program is to bring the students’ communicative, functional and academic proficiency to a higher level. Writing skills and expression are further developed through writing activities that are focused on current events and project based learning activities using iPad technology. The language arts curriculum encompasses the following aspects: grammar, comprehension, fluency, vocabulary, spelling, composition, and handwriting. This program consists of focusing on reading for comprehension and exposure to all literary genres. Students are actively involved in identifying plot structure, literary elements, figurative language, narrative styles, character analysis, poetic language, setting and mood of the stories. Students are assigned numerous writing projects that require speaking in front of an audience and using proper speaking techniques. iPads, Power Point, SMART Board technology, using Athena library program, publisher, and Microsoft office software are used in a variety of projects throughout the year. The math curriculum for the sixth grade focuses on the mathematical operations involving whole numbers, fractions and mixed numbers. It also incorporates computation processes, and the writing, interpreting, and usage of expressions and equations, as well as involving these properties in word problems and geometrical definition. It reviews the operations with whole numbers and decimals in order to introduce the integer numbers. The students get a better understanding of the proportional reasoning and applications, algebraic, geometric, and developing and understanding of statistical problems. The seventh and eighth grade math focuses on pre-algebra and Algebra I with emphasis placed on real numbers, properties, linear equations, and practical applications. The seventh grade curriculum includes developing understanding of and applying proportional relationships, operations of rational numbers, solving problems involving scale drawings and informal geometric constructions, and drawing inferences about populations based on samples. The eighth grade is presently participating in a “Dual Enrollment Algebra 1” course. The students enrolled in this program are instructed in expressions, equations, language: simplifying and solving with an emphasis on work with word problems, graphing linear equations and function notation: graphing and set notation of inequality solutions, systems and polynomials, and rational expressions and equations and simplifying radicals. All instruction in Math for the Middle school is based on a 1:1 iPad program. The social studies curriculum for the sixth through eighth grade encompasses American history, world history, American government, world geography, and current events. Students use their iPads to connect to textbooks, access history resources, and complete assignments. There is an annual history fair that is developed by themes, such as the Renaissance, Medieval times, art history, history of the Church, to name a few. The science curriculum grade sixth through eighth includes astronomy, physical science, life science and earth science. The curriculum is inquiry based following the scientific method. Instruction is differentiated using varying reading levels and lab activities in order to meet the individual student’s needs. The middle school students participate in academic competitions and science fairs district wide. In the science program full inquiry is encouraged. Students are provided hands-on activities in the science lab. Basic biological concepts are taught, and students are encouraged to observe closely objects and materials in their environment. The students attend special subject areas which include art, Spanish, physical education, music and computer. Teachers regularly work together on strategies that can be implemented across the curriculum for the benefit of the students. Students are encouraged to use their critical thinking and creative writing techniques to expand their knowledge in all subject areas. Teachers evaluate students’ progress through tests, quizzes, projects, observations, rubrics, portfolios, oral communication, and class participation. In addition, the teacher regularly gives the students opportunities to work cooperatively in groups to meet specific objectives. This enables the teacher to monitor social development as well as academic growth. Art education is given to all students from Kindergarten through eighth grade. It is a core discipline, essential to the growth and development of all students. Art Instruction provides an environment which offers challenges to all students, builds on individual differences, and provides means by which students may express themselves and develop positive concepts. By examining the idea of multiple perspectives, students can begin to understand what it means to be human and become more empathetic to the people, cultures, and environments they encounter. Students have the opportunity to participate in the annual school art show, the Dade County Youth Fair, and the Beaux Arts Festival. Music education is taught from Pre-K 3 through eighth grade. The curriculum focuses on choral performance and musical theater. In the classroom, students learn the skills necessary to effectively sing in an ensemble or as a soloist. The students are exposed to a variety of musical instruments and genres spanning many eras of music history. The class incorporates the basic, fundamental principles of music theory. Students are trained in Catholic liturgical music. Students participate in several musical productions through the year such as: Christmas shows and spring musical productions. Physical education curriculum is taught from Kindergarten through eighth grade. Spanish as a second language curriculum is taught from Pre-K3 through eighth grade. TEP is offered from 1st through 8th grade. In addition to the computer application skills, students are challenged and required to apply these skills in assigned projects in the areas of science, language arts, music, social studies and art through team teaching and cooperative group activities. The Technology Enrichment Program gives students an opportunity to challenge students in advanced grade levels, reinforce lessons taught in all areas, and remediate those needing support. Teachers assign work for students to complete depending on their ability. Assignments include working in the virtual science lab, math skills in Mathletics and other programs, enhancing their reading and vocabulary through Reading Plus and other programs, and conducting research for projects. The 6th, 7th, and 8th grade are using 1:1 iPads to access digital curriculum materials and student collaboration tools while also receiving individualized instruction in math, language arts, science, social studies and Spanish. The goal of this program is to enhance student learning using technology. School tours are available by appointment once a month. If Interested, please e-mail Mrs.Perez at gperez@st-hugh.org to reserve an appointment.